“This festival is a message”. Jarvis Cocker waxed philosophical Friday night shortly after Desert Daze’s 2018 opening ceremonies as a lightning storm brewed overhead. 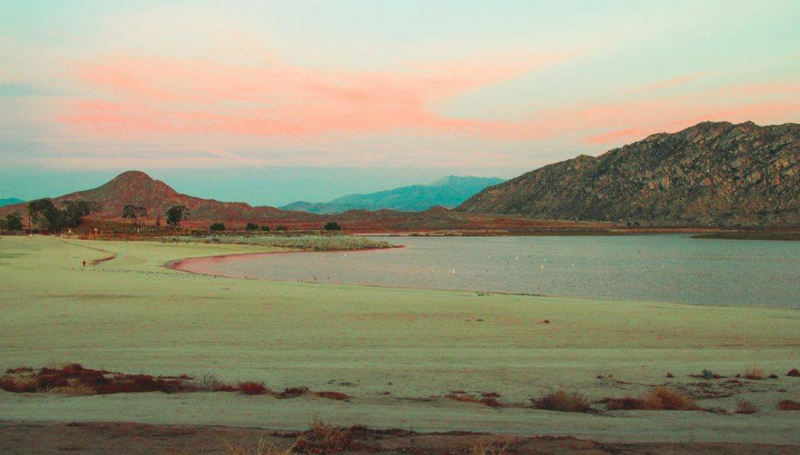 After a two- year stint in a cosy Joshua Tree location, the Californian ‘anti-festival’ has moved to the shores of Lake Perris, a few hours outside of LA. With a mega-watt lineup boasting Aussie pop ambassadors Tame Impala and the legendary My Bloody Valentine, many flocked to the Western US to partake in all flavours of the rock and roll nouveau. The aches and pains of hosting an outdoor festival in a new location did surface, but Desert Daze was able to deliver a few high points despite an evening weather cancellation on day one. As a third-year attendee of this event, I had high hopes about the new beachside setting and fantasized about the possibility of floating in the murky lake abyss listening to the aforementioned MBV. Long entry lines on Friday (averaging 3-5 hours for some) and the evening’s headlining set from Tame Impala being cancelled a few songs in left little time to enjoy the grounds for more than a few sets. IDLES, rounding out their sold-out U.S. tour, blistered the Theatre Stage in the tent to a frenzied crowd keen to take a dip in the pit. A spliced tab of Uncle Acid & The Deadbeats, performing on the release day of their 5th LP Wasteland, would become the central act of a quickly closing evening. The hope that Tame Impala might debut a bit of un-glossed material during their 10pm slot convinced me to linger into the main stage spread. After weaving through ‘Sundown Syndrome’, lead singer Kevin Parker quickly apologized, explaining the band’s exit before one of Desert Daze’s staff took over the mic. “The band will be back”, an assertion that would ultimately ring untrue as attendees were instructed to sit in their cars or tents and wait out the moderate storm. I suppose stateside we don’t have the clearance or gumption to frolic in the mud a la Glastonbury, which is rather unfortunate because it looks quite fun. 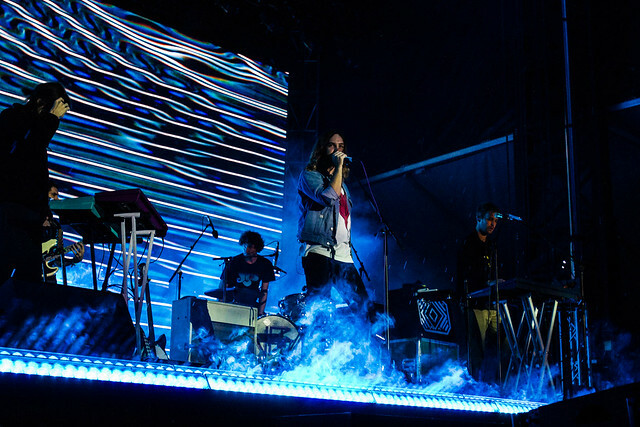 Rain was forecast for the duration of Saturday, and many questioned if the show would go on. Other than a few early sets being relocated (just in case) to the main Moon Stage, the remainder of the festival was able to escape any additional weather fiascos. Mercury Rev’s 1998 masterpiece Deserter’s Songs shimmered with the same optimism from a band who barely escaped tumbling over the edge prior to its release. During ‘Goddess On A Highway’, singer Jonathan Donahue’s quirky homonyms sailed beyond the crowd into the setting sun. One particular ‘pro’ of Lake Perris was that the comfortable beachside sand allowed for a communal gathering spot which still offered terrific audio enjoyability. 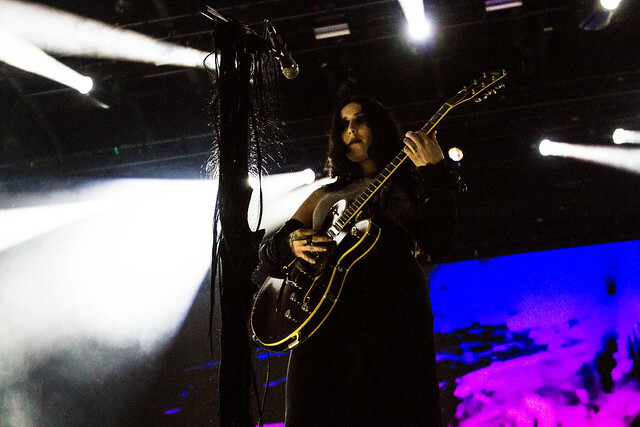 Chelsea Wolfe absolutely smouldered on day two, delivering an unparalleled vocal performance that was impossible to tear away from. Seeing as her last album, 2017’s Hiss Spun, was recorded in Salem, Massachusetts, the sinister and otherworldly guitars could stand to fracture a soul less prepared for her reckoning. 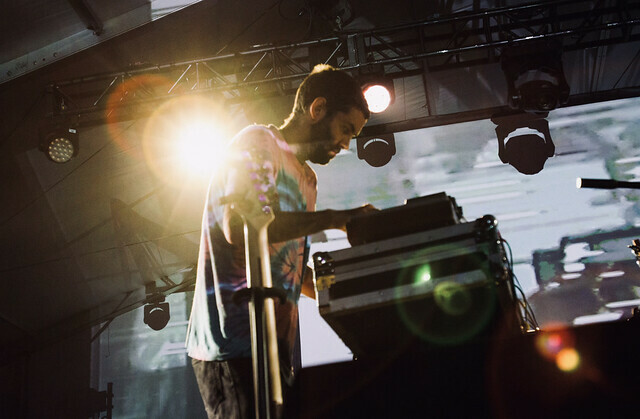 Perhaps the most refreshing act of Desert Daze came in the form of Bristol’s Beak>. I was a bit spoiled in that I got to see them in LA with A Place to Bury Strangers for one of the festival’s pre-shows and opted for them again when they conflicted with King Gizzard & the Lizard Wizard. It was worth it to hear their stage banter about KGATLW’s name alone. ‘Brean Down’ from their second LP this year, >>> has sort of a modern spy groove to it, maybe something you’d drive a getaway Aston Martin to, out of the rain in the desert. ‘The Brazilian’ has this little soft kick-back about 3:00 in that really reels your brain with ominous sci-fi synths when seeing it live. Intelligent, thoughtful, tasty. It was a bit disheartening to see that many of the talks, such as the Q & A with Steve Albini and the Retrospective with Gerald Casale of DEVO occurred right after the gates opened Sunday. I really doubted my ability to do a full 12-hour gander on the last day of an outdoor festival (plus I was staying a bit down the road), so my energy was stored to stay up for the majority of bands performing late. ESCAPE-ISM was comically jubilant, bestowing listeners with ‘The Lost Record’, the ultimate sermon in the rock and roll gospel: find the lost records, and love them. The ones that aren’t so much lost as they are unloved. I guess it doesn’t necessarily have to be vinyl? Bowie’s Earthling comes to mind. There was a brief moment of panic as it was announced that Chile’s Föllakzoid would be cancelling their performance a few hours prior, only to discover they were just joking and would totally be there after all. Having missed them at Levitation earlier in the year, I’d heard the singer sort of muses like a more psychedelic Brett Anderson onstage. Their set consisted of several trance takes from III, a fusion of ecstatic tribal rhythms and subtle wayfaring guitars that ultimately converge into a luminous quasar of electricity. If you asked me when one song ended and the next began, I really couldn’t tell you. It was one perpetual journey. Finally, the highest musical echelon I’d been waiting for, My Bloody Valentine, graced the main stage to a packed-out crowd. Another asset of this new location was the amount of open space. At Desert Daze 2017, I nearly got jumped by some amateur LA festival divas for moving closer to the stage for Iggy Pop (there was clearly room, I have manners thank you), but it was easy to dance my way into a prime spot during ‘Only Shallow’ and bathe in the brilliant light show provided by visual artist Astral Violet. While the set certainly warmed the hearts of many in the audience, I couldn’t help but feel jealous of those who’ve seen the band in a more intimate venue. “Thank you, My Bloody Valentine for opening for us,” Steve Albini deadpanned in the Theatre while preparing to blast skulls with Shellac. Though I missed the formal Q & A earlier in the day, the set was rife with some rather saucy antics about how Steve would love to consensually bang the entirety of the audience, or perhaps drop bombs on us instead. “That’s the problem with flying. When you’re high up in the air, you guys aren’t these beautiful people. You’re all just a bunch of dots. Who cares if I bomb a bunch of dots?” The title track of Dude Incredible ignited the adoring crowd into a mash of fists and frenzy, clearly a crew who’d also planned their afterparty activities to continue well after the Main Stage action. For all the hiccups and headaches in the beginning, there is still hope that Desert Daze will retain their “non-conformist festival” badge. The newly added VIP options over the years seem to be slowly infringing on that ethos. The reason this event is held in such high regard is the beautiful fellowship of kindred spirits and interactive playground/art world they’ve created, along with their timely intuition allowing them to book massive talent at the precise moment. The new location was breathtaking at times, and expansion for the sake of expansion is not always the easiest step on a logistical level. Even an all-star lineup can’t exactly save for poor communication (the bands never returned Friday), lack of attention to detail considering facilities (ATM’s, bathrooms), a few noticeable sound issues and, essentially, nearly an entire day of music lost. Jarvis was correct in that this festival is meant to be a message: one of unity, joy, freedom. A curated space for one’s deepest unbounded expression to roam wild. Desert Daze has the ability to tighten the reigns on this event before their inevitable growth escapes them. For more information about Desert Daze, including details of the 2019 edition, please visit the festival's official website.